Consumers Want Video Walk-Arounds. Here’s Proof! In my days with HomeNet Automotive, a new feature was released that allowed our customers to upload live video into their inventory for distribution to the third-party websites that would allow it. Being in sales, I wanted to have a real video in which I could show potential clients the possibilities and an actual example of what one would look like so I enlisted help from a friend of mine who’s a GM at a nearby dealer group to allow me to video one of his employees doing a walk-around. After filming it, I used it here and there when showing a demo of IOL Pro, HomeNet’s core inventory management software. After I left HomeNet Automotive, I promptly forgot about it. Recently, I came across it in my YouTube video list and was ASTONISHED to see that it had almost 12,000 views in about 21 months! That’s an average of 570 views per month! This is without ANY exposure or publicity whatsoever. It was not on a blog post or anywhere. I can only guess that these 12,000 people came across this video via keyword searches either within YouTube or via a Google search. I did a quick keyword search and was astonished to see that my non-distributed or promoted video ranked 2nd in Google organic search results! Imagine if this video had actually been a part of that dealer’s actual inventory on their website as well as all the third-party sites. Given that this was a new vehicle, it could have been added to all of the listings for this model and year vehicle in their inventory. They could DOMINATE Google searches for their brands. The proof is in the pudding. I highly doubt the people watching these videos decided randomly to watch a video walk-around of a Toyota Venza. It’s more likely that these were consumer’s interested in that vehicle. This is advertising GOLD and cost them absolutely nothing. On October 18, 2011, Google announced via its blog that it is setting the default search settings for all people signed into their Google accounts to an encrypted search. What does this mean for you? It means that your Google Analytics will no longer tell you keyword data on any person which clicked through to your site while logged into their Google account. This is very crippling from an SEO standpoint as keyword data is vital in your SEO and conversion efforts. Knowing what people were searching for that lead them to the link that they clicked on which brought them to your sight is valuable information to any company’s marketing efforts. Keep in mind that Google has offered the encrypted search setting for a while now. The key difference is that consumers would have had to go into their setting and manually change this to an encrypted search and, really, who would really do this? Now, it’s encrypted by default, and, using the same logic, which consumers are going to go into their setting and change it to unencrypted? I believe most people would choose to give out less information than more given the option (which they’ve always had). However, I also believe, just like with Facebook privacy settings, that most people will not go into the settings and change them or learn them for that matter. The average consumer lives by default and if the default is now encrypted, it just means that your Google Analytics reports will contain less key information in them. There is only one exception to this withholding of keyword conversion data. 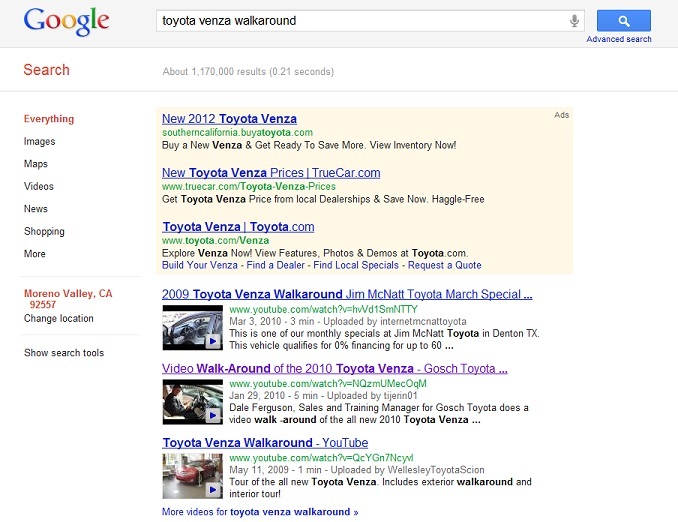 Encrypted keyword data will still be provided to Google Adword advertisers. That’s certainly a value add to entice more businesses to use Google Adwords and a way to leverage and monetize information for Google. This week, I had the privilege of attending the Industry Summit – which includes 3 conferences — the F&I Conference, the Special Finance conference and the VSCAC conference. These conferences focus mainly on F&I and special finance topics. In this age of internet shopping, however, credit-challenged shoppers are also researching on the internet – whether it’s typical online car research or they’re searching for financing assistance online – so I wanted to see what advice and tips I could learn to share with our audience. I was quite surprised to find that finance companies are interested in penetrating the franchise dealer market with hybrid “Buy Here, Pay Here” programs. Dealers lose many car deals each month due to the inability to secure financing for their customers. The idea is that the dealer would carry the note for 90 days, then these companies would purchase the notes for $.60 on the dollar. If structured correctly, and with the right program guarantees and commitments to buy these loans from these companies, a dealer could potentially pick up a decent amount of deals they otherwise wouldn’t be able to keep on the road (or put there in the first place). An example given to me was of a franchise dealer who amassed a $22 million portfolio which he could cash out at any time while making a $5 million net profit. I could see this as an alternative method of financing – a last case scenario – for franchise dealers who are selective in whom they carry notes for or a new way for dealers with a high demographic of these customers to gain more deals and market share. Whether they choose to carry the note past the 90 day period is entirely up to them and, if structured properly, could mean extra profit and deals each month. Many stereotypical “Buy Here, Pay Here” lots went under during the hard times we’re just emerging from and this is a great way to capture market share quickly. I could see many customers who would feel more comfortable and willing to participate in a program like this offered by a franchise dealer versus the small used car lot that these programs typically exist at. One of the most popular and well attended sessions was a Marketing and Advertising Dealer Panel regarding special finance with Scott Falcone, dealer, World Hyundai Matteson and Tom White Jr., general manager, Suzuki of Wichita. Many of the dealers in the audience wanted advice on how best to operate a special finance department including how to handle & identify those customers early in the process. Scott Falcone said that instead of treating special finance customers differently, they handle all customers as if they were special finance from an investigative standpoint. Tom White agreed saying that the most important question they ask on the meet & greet is regarding source and that usually helps identify those customers who may need special financing assistance. Scott addressed another question regarding what to do to keep that special finance customer distracted while you are waiting for a call back or bank approval. He strongly suggested that dealers test drive those customers who can’t buy cars. By doing that, they get excited and are more likely to work with you with a co-signer, etc. and they get excited. 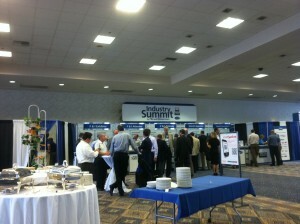 The exhibit hall was mostly filled with F&I product companies although I did see a few familiar faces. 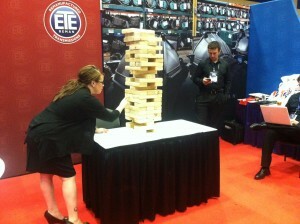 The coolest “interaction activity” in the hall was, by far, the large game of Jenga constantly being played in the ETE REMANbooth. I “almost” won that darn game. We ended up standing on chairs just to place the next piece on top but, in the end, the employees won. I still smile when I think how brilliant that game was for them. Everytime a game was lost, a ton of 2×4 planks came crashing down causing a lot of noise which could be heard in the whole hall and attracted a lot of attention. 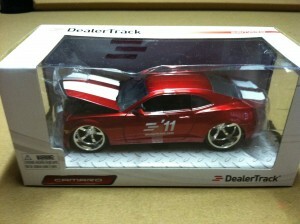 … a sweet car from our friends at DealerTrack! Thanks again for the car! My 5-year old has been playing with it NON-STOP since I got home. Thank you to all of the people involved in inviting me to the conference – Ed Bobit, Dave Gesualdo and Greg Goebel – it was a privilege to attend and get an insight into the world of F&I and special finance.